Hello everyone! 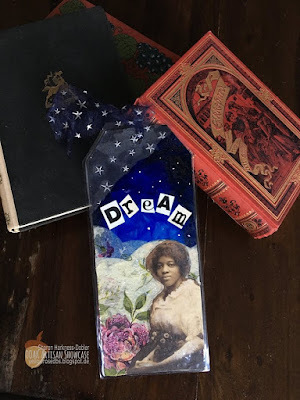 Here is another project designed with book lovers in mind. This vintage inspired bookmark was fun to make. It requires few supplies and its quick and easy to make. I used a large watercolor tag, a pretty napkin, a few paints and fabric. I chose to use a photocopy of a picture that I found on Pinterest, however, family photos are great for this project as well.